The proposed one Galway Airtricity League team will be debated at an open meeting for members and supporters of GUST at the Galway Rovers clubhouse, Claddagh, next Monday at 8pm. GUST are urging all members and supporters to attend as the management committee seek to brief them on the current situation. It is rumoured that GUST members are unhappy with the process undertaken following the recommendation made in the Ned O'Connor report in October 2012. O'Connor, the former Tipperary South County manager, indicated that the best way forward for the senior game on the banks of the Corrib was to have one team operating in Galway. FAI Chief Executive Officer John Delaney has stated that this objective will be achieved, but GUST members are believed to be angry that sufficient progress hasn't been made. GUST, Mervue United, Salthill Devon, and the Galway FA have been involved in lengthy talks since the start of this year and interested supporters are welcome at the Claddagh venue on Monday. With the FAI Ford Cup taking centre stage this weekend neither Galway side has any game in the First Division. Last weekend, though, Mervue United's hopes of a top two finish were dealt a significant blow as they lost 4-2 in an action packed encounter with table toppers Athlone Town. Johnny Glynn's side delivered a fine performance, but the failure to convert two penalties ensured Athlone, who amazingly finished with nine men, dug out a vital victory. In a truly mad match Ryan Manning missed a ninth minute penalty after Athlone's Aiden Collins had been sent off. Then Philly Gorman bagged a spot-kick to give Roddy Collins' midlanders the lead before Stephen Walsh levelled. Goals from Gorman and Enda Curran, who continues to produce in attack, had Athlone in command, but Mervue came swinging back once more. 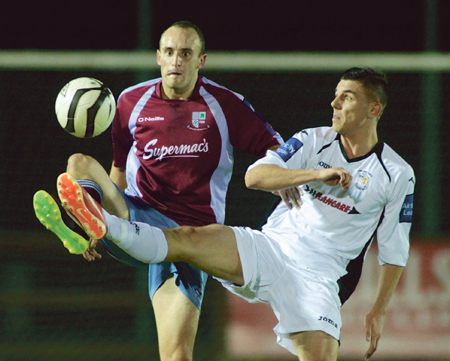 Tom King trimmed the deficit, but Athlone nerves were settled when Curran netted his second. Athlone had goalkeeper Paul Skinner red carded late on, but Barry O'Mahony's resultant penalty struck the woodwork and the midlanders prevailed. The result means that Mervue now trail Athlone by a dozen points and they are seven behind second placed Longford Town, who beat Salthill Devon comfortably on Saturday. Three defeats on the spin have halted the bit of momentum Salthill had been generating and Jumbo Brennan's team are struggling to overcome the loss of key players in the July transfer window. Graham Kelly, Derek O'Brien, and Curran had occupied leading roles in Salthill's mid season improvement, but now they are lacking confidence. Cobh Ramblers are still six points clear of basement boys Salthill, who were thumped after the restart at the City Calling Stadium by Longford. Having encountered some turbulence themselves recently Longford craved this type of a game and David O' Sullivan's 23rd minute strike had Salthill under duress. Then two goals from Josh Hanlon and one from O'Sullivan completed the rout ensuring that Salthill's chances of avoiding another last placed finish are fading.